Handmade exclusively for Nourish™, Mussels Napkins will add texture and whimsy to any tabletop. Printed in rich blue tones, this gorgeous pattern of shells, pearls and starfish will dress up any tabletop. The white 100% cotton linen machine washes, dries and irons up easily. Each smartly wrapped package includes a set of six napkins. See below for a pattern detail. 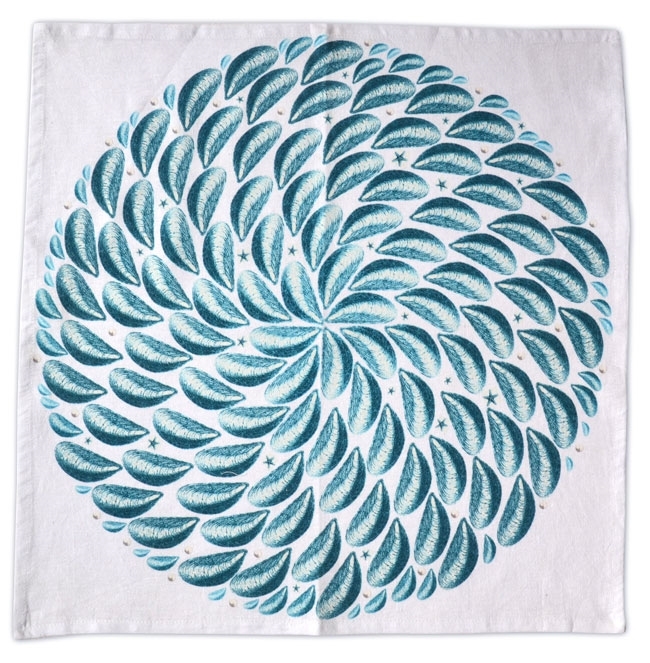 Browse our selection of other gorgeous napkins and our unique handmade Napkin Rings for your favorite finishing touch. 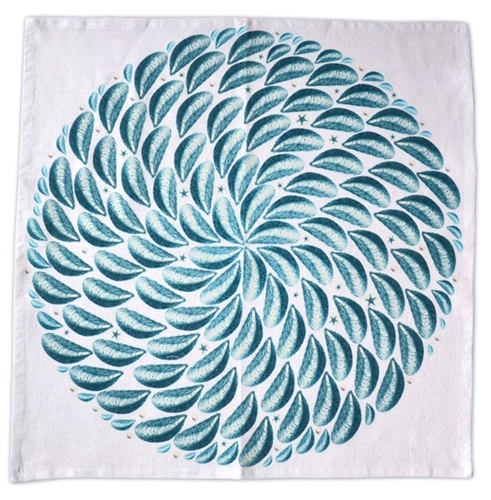 100% cotton linen, 20 inch napkins imprinted with our Mussels pattern — set of 6 napkins. Handmade exclusively for Nourish™, Mussels napkins will add texture and whimsy to any tabletop. Printed in rich blue tones, this gorgeous pattern of shells, pearls and starfish will dress up any tabletop. A perfect gift for the sea lover in your life! The white 100% cotton linen machine washes, dries and irons up easily. Each smartly wrapped package includes a set of six napkins. Enjoy them for yourself or bring them to your next event as a hostess gift. Snappy Napkins. Set of 6. Menagerie Napkins. Set of 6. Pansy Napkins. Set of 6. Citrus Napkins. Set of 6.